In small bowl, combine broth, cornstarch, soy sauce, wine and molasses; blend well. Set aside. Heat oil in 12-inch skillet or wok over medium-high heat until hot. Add chicken strips; cook and stir 4 to 6 minutes or until chicken is no longer pink. Remove from skillet; cover to keep warm. Add bok choy, carrots, zucchini and mushrooms to same skillet; cover and cook 4 to 6 minutes or until carrots are crisp-tender, stirring occasionally. Stir cornstarch mixture until smooth. Add to skillet; cook and stir until sauce is bubbly and thickened. Stir in onions and chicken; cook and stir until thoroughly heated. 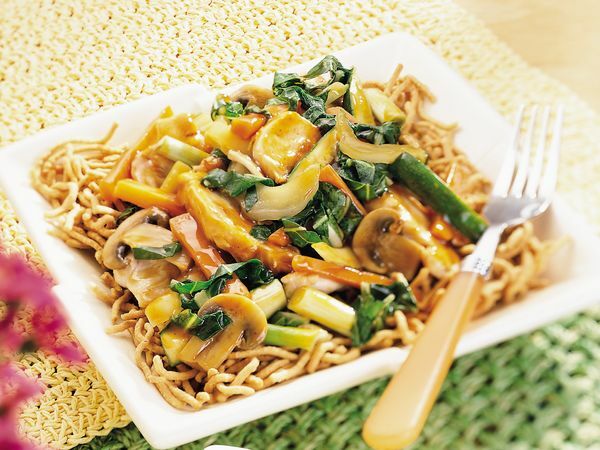 Serve over chow mein noodles. If desired, serve with additional soy sauce. To substitute for bok choy, use packaged coleslaw blend or Chinese cabbage, or a mixture of sliced celery and another dark leafy green such as kale.